I’ve been helping other authors produce and release their books for so long, that I’ve forgotten how fun it is releasing my own books! A lot has changed in a year. In both the industry and for me in terms of what I know now vs then. 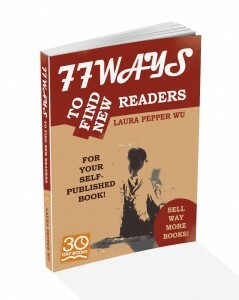 My new book, 77 Ways to Find New Readers for Your Self-Published Book, is completely different from the wedding guides that I’ve published in the past. Here are some thoughts from the process this time, along with some advice. 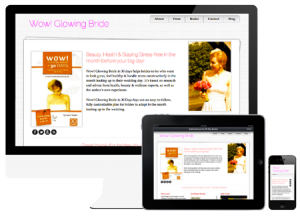 – I was very impressed with KOBO Writing Life, which wasn’t around this time last year though I did upload my wedding books as soon as they opened their doors. They make it super easy to upload an ePub and everything was smooth sailing. –> If you haven’t done this yet, run, don’t walk, over to KOBO and upload your ePub. They are offering 80% on royalties between now and Nov. 30th vs their usual 70%. If you are publishing with Smashwords, I recommend that you uncheck the KOBO option and publish directly with them. – I had way too much fun optimizing my Amazon page. I’m such a dork. I spent hours (yep, hours) scanning the best categories to put the book in. I tweaked and tweaked my product description until I was happy with it. I created a new author central with my married name. –> Categories, Keywords (different from tags) and your Product Description are all really important parts of what I like to call your “visibility and irresistibility” on Amazon.com. 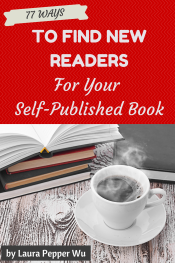 If it’s been a while since you looked at yours – or if you rushed it when you were uploading your books – go back and check that yours is doing your book justice. I will be talking more about the importance of product descriptions next week! –> In an email from Amazon last week, they announced a new feature for the new Kindles that shipped on September 14th to help readers learn more about the authors. The feature, called ‘About the Author’ will take info from your Author Central page, so make sure that yours is updated! – Although Amazon still rules the road in terms of sales (for me), I actually enjoyed the process of uploading to B&N’s Pubit and KOBO far more. For some reason KDP seems far more complicated, but maybe that’s because they just are a more sophisticated platform? Pubit & Kobo allow you to choose more categories (3 and 5 vs Amazon’s 2). – I’m not going to enter KDP Select this time, at least for now. I had great success with it earlier this year, and three of the authors that I coach had over 20,000 downloads over their two free days as a result of us “working the KDP Select game”. This resulted in a better ranking, more reviews and a lot of sales for weeks after the free days. I think that if you play the game right it can be a great sales booster. However, I want to give my book – and the people who want it and don’t have Kindles – a chance in the world before I consider KDP Select and its exclusivity. 77 Ways is available on the Nook, KOBO and PDF from the 30 Day Books site. I will also be making it available for Apple through Smashwords very soon. – I had a really hard time deciding upon the price. It’s a question that I’m often asked, and recent research has suggested that $2.99 is the sweet spot. This book is designed to help you sell more books. That means that, hopefully, if you were to purchase, read and implement it, you would make your money back several times over. There are tips in here that I charge at least 10 x more per hourly consult for. I don’t like to brag… but this is good stuff! I was tempted to price it much higher … but anyhow. It’s $4.99. 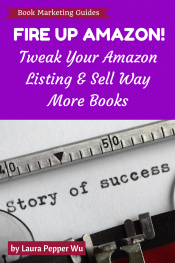 – I usually encourage people to drive sales to their Amazon page and NOT sell from their site, because I’ve seen first-hand what happens when Amazon promotes your book on your behalf due to good sales. On Amazon, sales breed sales, and that’s important to remember. Their internal marketing is powerful, and once they’re on your side, sales can snowball! However, I wanted to make a PDF download available because this is the kind of guide you may want to print out and keep by your laptop or scribble on. It’s also for readers in countries where eBooks are harder to get (Pakistan for example, where you cannot get your hands on Kindle books unless they are pirated). So I’m going against the grain! The PDF is priced the same as the eBook. –> If you want to make a PDF available, eJunkie (which admittedly has an awful name), is a great, and easy to use site. You pay $5 a month to sell from there, they don’t take a % per sale, and all transactions are done through PayPal which offers your readers peace of mind. 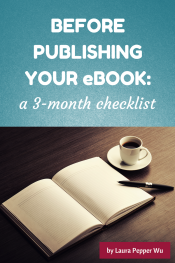 – Because I got the eBook together in under a month, during the stress of the Authorlicious launch and more, I did not take my own advice with this one – to start early! However, I do already have a platform and an audience to present this to. With my wedding book, I had zero platform and I started promotions an entire year before I put the book out. This one is a different story, so I’ll be happy to report back on the results in a couple of weeks. – You guys are AMAZING!!! Thank you for all of the tweets, FB posts, messages and shares since the end of last week when I let the ball slip about the book coming out. I’ve said it before and I’ll say it again, the indie community is super lovely and I am very happy to be a part of it. Lots of hugs for you today! 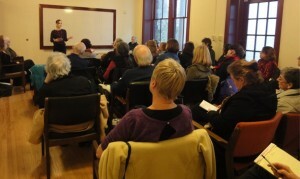 What did you learn from launching your book recently?